Over the Holiday break, my mom drove down and brought my nephew, Anthony, with her. It was an extra treat for me to have both of them. Anthony is a sweet, creative, gentle boy with too much energy to be confined inside. The first morning they were here I got up and went to let out the chickens as normal around 7am. Just as I was walking to the coop Anthony came barreling out the door with a long sleeve shirt in hand and one shoe still not on. He desperately wanted to go see the chickens with me! I said I would wait until he was properly clothed. Makes me laugh even now. Dressed now, we headed up the hill. I let the chickens out of the coop and after they all ran out I teased him he would have to clean up the chicken poo. He, of course, was not interested in that. He only had eyes for the chickens, I’d say he had already caught the Chicken Fever after only one night here. We had really nice weather, most of the day’s mom and Anthony were here it was in the upper 50’s and low 60’s. This was so nice because we spent a good amount of time outside. Which, of course, meant lots of time with chickens. He got up the nerve to pick up one of the chickens and he snagged Agnes! She is an Ameraucana and is very sweet and gentle. 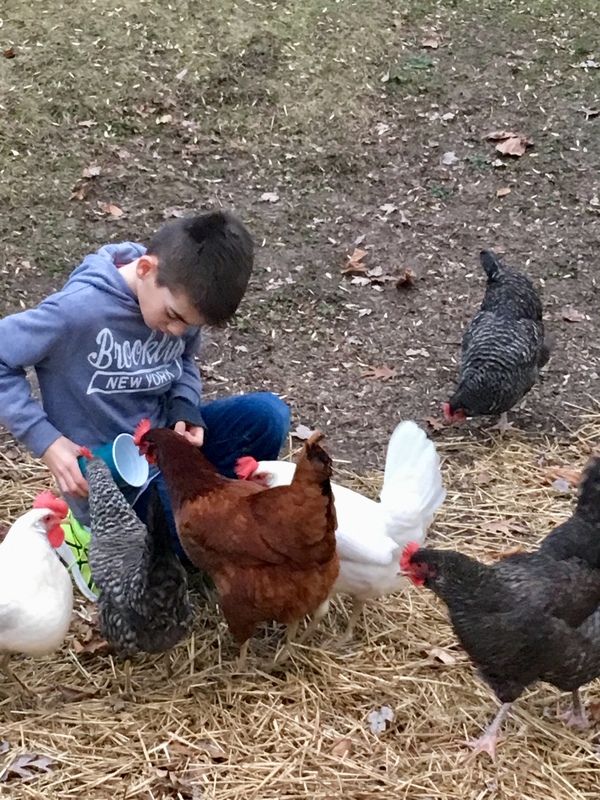 After just a few days he was very comfortable with the chickens. He gave them snacks every day. He even hunted the dirt for worms to give them. No doubt he would be a great Chicken Keeper. Katie? Andy? What do you think? Can he come to live here and take care of the chickens? I’m sure he wouldn’t even mind cleaning up the poo! He loved collecting all the eggs and was very excited about the blue ones. He asked if he could take home some eggs for mom and dad. He also ate eggs almost every day while here. He knew exactly which chicken gifted the egg he was eating. I’m sure that makes them taste better. 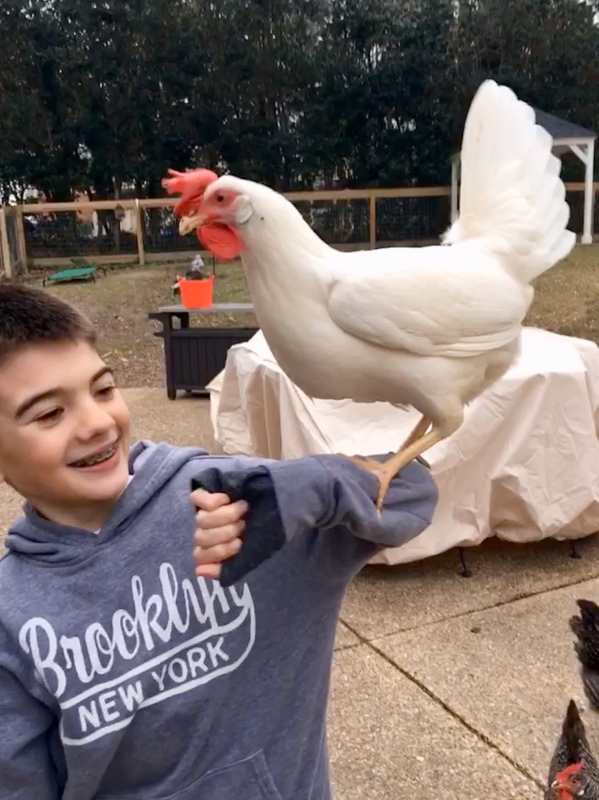 Anthony with Dottie, the White Leghorn. As I’m writing this I’m watching the chickens via a closed circuit camera. I’m doing this because I’m trying to determine which one of my True Blues are laying. Currently, Louise, the chicken that was broody last fall and then molted, is in a nesting box. I really thought the blue egg layer was Kittie as she did not molt. Having said that subconsciously I must have thought really it was Louise because that is who I marked as laying in my chart as well as writing her name on the eggs. A bit of egg-laying background. As the days get shorter chickens lay fewer eggs and some stop laying all together. The end of November we saw a definite decline in egg laying in our hen house. You know, just as Chuck starts doing extra baking of cookies, cakes, and bread. Hens do not lay eggs in the dark, so with the shorter days leading up to the Winter Solstice, this is normal for egg-laying. 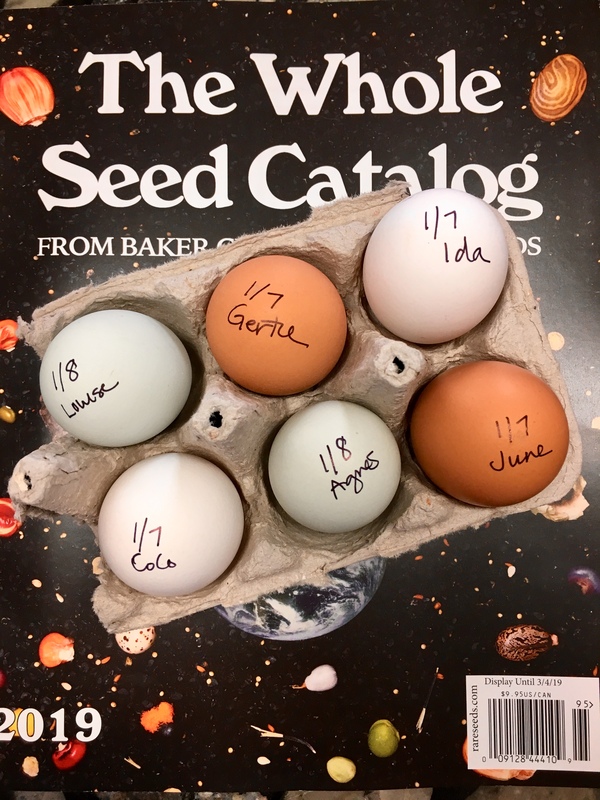 Now that we are on the other side of the solstice the days are beginning to get longer and therefore more eggs begin to be laid. The nesting boxes have been like Grand Central Station today. So far I have an egg from Agnes, Ida, and Coco. Louise is still sitting in a box, she has been in and out for the last hour or so. She has been in four different boxes. I guess she is trying to get inspired. Perhaps Kittie has been the layer, and now with Lou, maybe I’ll get two True Blue eggs today. Yesterday I collected my first Cuckoo Maran egg from Gertrude since November! I’ll keep watching while I do my chores. I hope today is another 5 egg day. We have had three of those this week. For the last month, we’ve been averaging 2 eggs a day. I actually had to buy a couple dozen eggs. With the longer days it will make for busier chickens. 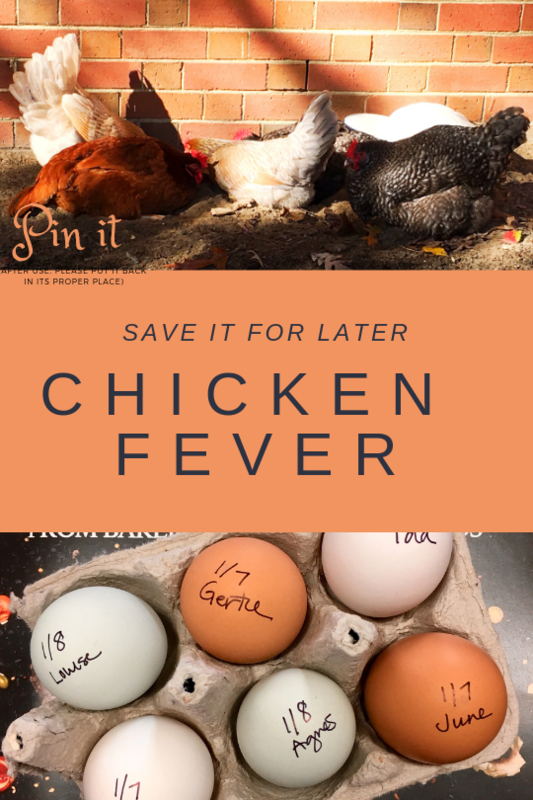 Come for a visit and see if you catch the Chicken Fever, too! We will see how contagious it is with my brother-in-law, Pete, and his family here this weekend. Then the following weekend my oldest two boys, Charlie and Ricky, arrive from Michigan. Also, Charlie’s girlfriend, Agatha, is coming with them. Charlie said she wants to learn to knit, I can definitely help with that, and I think she is the most likely to catch Chicken Fever. I’m looking forward to these visits! Happy knitting and happy egg collecting. Wow love it! I didn’t know that about chickens. Maybe you need more…do they taste better. Then the store bought? I know the different store bought eggs taste different. The yolks are yellower but to be honest I don’t taste the difference but Chuck and my mom say they can. Chuck wants to get more chickens. We will see what the spring brings. As always I enjoy your tales of family, Chickens and life in general. My son In law who currently lives in Guam Had chickens until the hurricane came along and destroyed everything. Luke loved the Americanos. He loved picking them up and petting them. 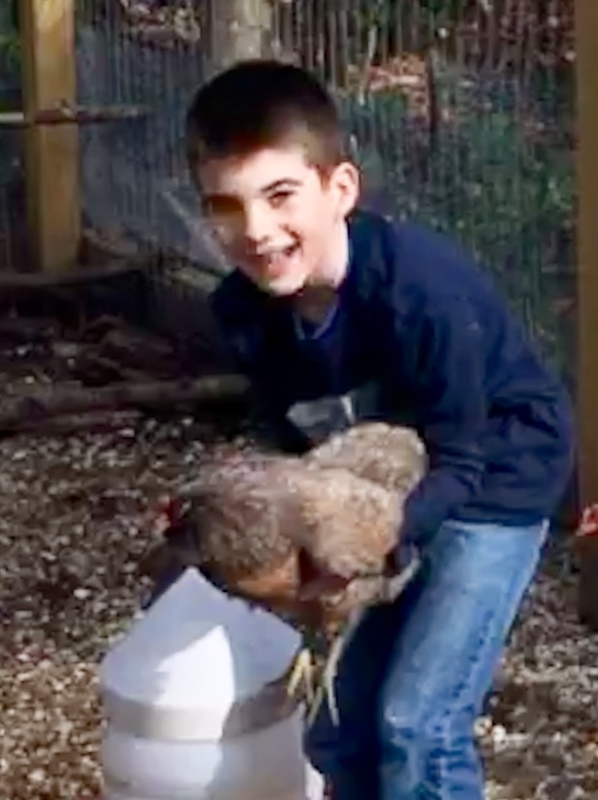 Little boys and chickens just naturally go together. Feel the love.